This year's Fiber Fest on March 13th will once again celebrate and honor the historical and present entrepreneurship of women. 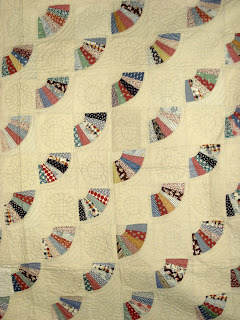 In keeping with the work of women, the 2010 Fiber Fest drawing prize is a quilt donated by Mrs. Elizabeth J. Tice. Elizabeth’s mother pieced the quilt, then hand-quilted it in the “Shott Pattern,” designed and drawn directly onto the quilt top by Elizabeth’s oldest brother. The quilt has never been used and is estimated to be approximately 80 years old. Elizabeth’s brother, Carl Shott, worked “in the office” for Bethlehem Steel in Lebanon, Pennsylvania – Pennsylvania Dutch Country. His job was to work on forms for the stamping plant. The designs on the quilt are of his creation. Carl lived in Lebanon, Pennsylvania his entire life. Elizabeth, too, was a lifelong resident of Lebanon until her recent move.